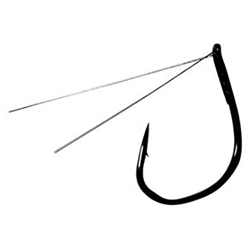 "Special Wacky" medium wire hook was designed with a revolutionary bait pocket in the bend of the hook. This unique feature allows the bait to sit perfectly balanced for realistic action and hook performance. In addition, the design offers an extended gap between the hook eye and point providing optimum line separation from the bait.